PARIS (AP) — High-divers plunged into the River Seine, trampoline athletes somersaulted inside the Petit Palais art museum and runners raced on a floating track as Paris turned some of its world-famous landmarks over to sports on Friday in hopes of wowing the International Olympic Committee. 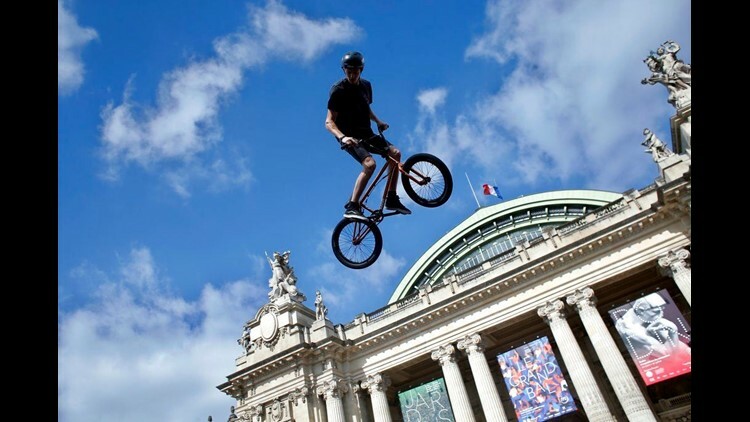 With Paris competing against Los Angeles to host the 2024 Olympics, bid organizers hoped the two-day festival of more than 30 sports would help showcase the French capital's suitability for the games. Divers demonstrated their skills from boards installed on the Alexandre III bridge that spans the Seine, as kayakers also paddled on the river. In the Petit Palais , trampoline athletes bounced skyward toward the museum's ornate ceiling murals. Olympic judo champion Teddy Riner and other French sports stars raced for fun in a 100-meter dash on a temporary track floating on the Seine. Paris Mayor Anne Hidalgo said the Olympic celebration is "a way to show how we want to party together, with the whole world, by welcoming the games. We hope so!" But four people were injured, one seriously, when a double-decker sightseeing bus that took a detour to avoid the sports shows got stuck inside a tunnel, police and the bus company said. On Saturday, Parisians were also being given an opportunity usually reserved for Tour de France racers: to pedal around the Arc de Triomphe without its frenetic vehicle traffic, which will be stopped for three hours. Elsewhere, a climbing wall was installed inside the Pavillon de l'Arsenalmuseum of Paris architecture, for free use by the public. Also planned were demonstrations of an array of Olympic sports, including fencing, boxing, archery, gymnastics and others. Paris' show comes ahead of a crucial IOC meeting in July that could decide to pick the 2024 and 2028 Olympic host cities both at once — in a final vote in September in Lima, Peru. The only question would then be which city gets which games. Paris says it is bidding only for 2024.